Do you have an fire evacuation plan for your family? If you only have one pet the plan should be easy to include the pet. 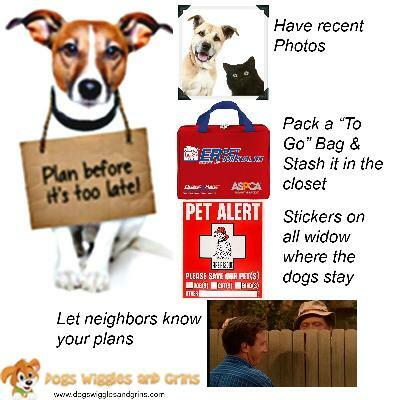 If you have multiple pets like a lot of us do, you might want to plan for them too. Some things that struck me about evacuating multiple pets, is what do you do with them after you get them out. You can't take them all out at once. They are going to be scared and non cooperative. So, you grab 1 or 2, or as many as you can. Where are your collars and leashes? What are you going to do with them once outside? If you have more than 1 or 2 pets you will have to go back for the rest. You know you will. You can't just tie the ones outside to a tree. They will choke themselves trying to get free. What about after everyone is out and you can't get back into your home because of smoke or whatever. Everyone's paperwork is still in the house. Did you grab your purse or wallet on the way out. I'd bet not, I would be so busy trying to get everyone out that paperwork would be the last thing on my mind. I thought long and hard about what it would take to "go on" if I were ever burned out. Basic stuff you will need right away, some stuff you will need later, but all will be needed and it may have been destroyed. Plan a drill so everyone knows their part. Have your house alarms sound and have everyone practice. Even the pets. Pick a safe spot to meet for the humans. Plan which human will attend to which pet. Have a safe haven for the pet/s once outside. I have 6 dogs. They are all very large. My neighbors would not be any help for housing even for a minute because my dogs are spoiled silly and they would tear up my neighbors houses trying to get back to me. So, my solution is put them in our vehicle. Our mini suv will not hold enough crates for them all so I decided my blind girl would be crated and the rest just in the vehicle. My dogs are socialized together but under duress (like a fire) you never know what they might do. I have multiple crates in the garage. Once dogs and people are out of the burning building I would set up crates on the lawn or a neighbors lawn. At this point I can stand with the dogs so they aren't worried about me. Make a stash bag of paperwork and store it in a secure place that is reachable in case of fire. Make copies of your dogs medical records, tag numbers, include pictures of everyone. Make copies of your drivers licence, credit cards. copy a check for your account numbers, birth certificates and any paperwork that you use weekly or monthly. Remember, the original may be crispy after everything is said and done. Make a stash bag of canned pet food. Put all their medicines together so it's easily accessible and you can grab it and run. I would stock this bag with canned food and a can opener. Just 1 or 2 meals will do because by the next day you will have help or can get to a grocery store. Make a plan on where you will go until repairs are made. If you have family, see who will take you and your pets. If you don't have family, check your local area for motels/hotels that accept pets. The most important thing to remember is, you can rebuild if you are still alive. So saving lives is the most important thing you can do.